It's 6 hours until kick-off. And when I say kick-off I mean the time when the shaker meets the ice. This year's Super Bowl theme at the t:e organization's home base is "Mexican," having recently returned from a trip to the beautiful Riviera Maya where I fell in love again for all things tequila, including Anejo and Reposado, which I had yet to warm up to. But, we're talking about margaritas here (not very Mexican, actually), and for that particular cocktail, I'm partial to un-aged tequila. Ask me in two years and I'll surely be going on about how a Reposado is much better in a margarita. I've been known to change my mind on these issues. Let's make something clear right up front, and set the tone here: a margarita should contain no more than 4 or 5 ingredients. It should also not be neon green in color. And it most certainly shouldn't taste like candy. If you see anything like this stuff pictured below, run the other way. Once again I found myself emailing iamnotachef about food instead of posting on this blog about food. Don't get me wrong, I'm not under the impression that there's a collective minion out there who are hanging on my every word, but every now and again I feel the tinge of responsibility to actually keep this blog going, rather than just shutting it down completely or let it sit out there dormant. For today, my choice is to keep it going with another post. I emailed iamnotachef a few mornings back telling him that I've been really into making green chile stuffs, which are way better than ketchup. About 10 minutes later, he's got this post about how mustard is the "new ketchup". OK, well, first off, he shamelessly stole my idea. Second, he's wrong: green chile stuff is the new ketchup. Update (2013/09): Bobcat Bite has moved and is now called Sante Fe Bite. Story here (click me). 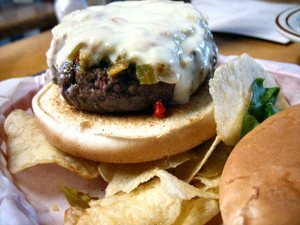 I can't remember where it was that I first heard about Santa Fe's Bobcat Bite and its burger. It might have been George Motz's documentary Hamburger America. But I think it was even before then. Regardless, it's been on my "list" for some time now. And I was very excited to finally get a chance to pull up a stool and grab a green chile cheeseburger here.